For future research and publication, I’ve been updating my Out-Of-Core Sparse Voxel Octree Builder (or ooc_svo_builder, if you’re in a hurry) based on our HPG paper. It’s faster, cleaner and more fun! Source, Win64/Linux64 binaries and manual can be found in the github repository. It also builds on OSX. New voxelization method based on the Schwarz & Seidel method. To my knowledge, this is the first public CPU-based implementation of the non-solid voxelization method from their excellent paper. The old method (based on Huang et al’s work) is also still available in the source. Faster morton code encoding method based on LUT’s. See this blogpost. Sparse model SVO Building optimization using a small extra buffer, configurable with -d. This delivers a great speedup, ranging from 60% to 80% for most models. Configurable VoxelData structure now, instead of DataPoint struct. It’s now easier to add your own voxel payloads to the framework. Support for vertex color sampling in tri_convert. Linux compilation fixes. GCC should be a happy compiler now, no warnings. Updated Readme.md to contain the full manual, removed the old HTML one. Converts an existing model (bunny.ply) to our .tri format. Results in bunny.tri (header) + bunny.tridata (actual data). Builds an SVO of size 4096^3 on bunny.tri, with a runtime memory limit of 128 Mb. Results in bunny.octree (header) + bunny.octreenodes (nodes) + bunny.octreedata (voxel payloads). The file format is described in the readme, and the header file octree_io.h contains read/write methods for this file format. 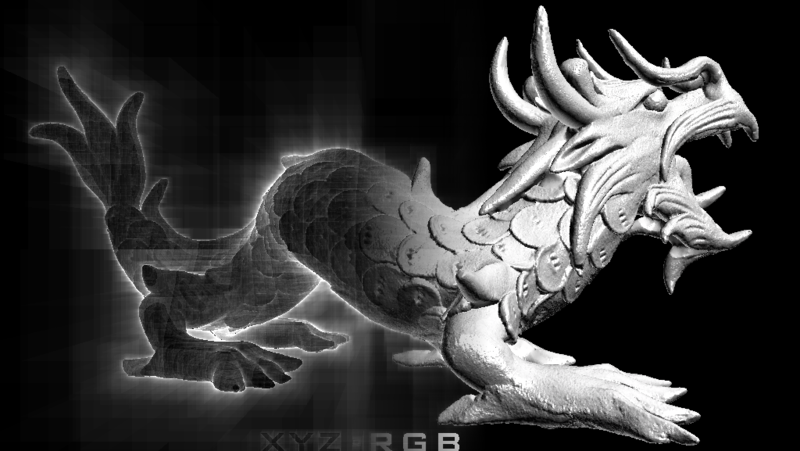 Voxelized dragon. Left side: Intersections / pixel show the structure of the SVO. Right side: Rendering of SVO with normal vector payloads with diffuse + phong shading.